UPDATED November 2, 2016 – Beltone Hearing Aids Reviews provides a complete review of Beltone hearing aids and models. Beltone hearing aids is a company that produces high-quality digital hearing aids to suit any hearing need. The company, based in Chicago, was founded in 1940. In its more than 60 years providing hearing instruments, Beltone Hearing has grown to be one of the largest hearing aid manufacturers in the world, selling products in the United States, Canada, and in over 40 other countries. In fact, Beltone has over 1500 Beltone hearing aid center offices in North America alone. Performing a lifestyle assessment, health history, and hearing goals with a Beltone hearing professional. Undergoing a hearing evaluation, to determine what, if any, hearing loss exists. The audiologist will explain the results of the hearing evaluation. Often, no hearing loss has occurred, or the hearing loss in temporary, due to an ear infection, or wax build-up. In these circumstances, no hearing devices are necessary. If hearing loss is detected and treatable with a hearing aid, the audiologist will demonstrate some of the many Beltone hearing aids. The final step involves the fitting and delivery of the Beltone hearing aids. With many different products and many different styles to choose from, finding the right Beltone hearing device is easy. An annual Beltone hearing aids reviews evaluation: This 6-step process is designed to determine the extent and quality of hearing loss, as well as to determine the individual’s eligibility for hearing aids. BelCare Lifetime Care: For the life of the hearing aids, Beltone hearing aid wearers can receive follow up care at any of the more than 1500 Beltone Hearing Care Centers in North America. This involves annual hearing screenings, and free hearing aid inspections, including cleaning and repair of the hearing aids, if required. A 30-Day refund policy: Beltone hearing aids can be returned in their original condition within 30 days of their delivery. A patient care phone line: A patient-care line is available any time the Beltone wearer needs assistance. Minimum loss required for hearing aid fittings: Beltone hearing specialists will not fit individuals with a hearing aid unless their hearing loss warrants such intervention. Those with temporary hearing loss, and hearing loss that cannot be treated with hearing aids, will not be fitted with a Beltone product. Quality control review: The individual’s hearing aids will be examined and approved by a hearing instrument specialist to ensure that the device has been fit to their individual needs. Establish hearing expectations with the audiologist: The Beltone audiologist will provide the hearing aid wearer with a program of personal counseling and aftercare to make sure the adjustment to the new hearing aids is going smoothly. Assistance adapting to the new hearing aids: Follow-up appointments with the Beltone specialist helps users ensure that their hearing aids are correctly adjusted to the needs of the user. Better hearing Verification: Within 30 days of receiving their hearing aids, the user will be evaluated to ensure the devices are providing the best hearing possible. Warranty, and “Lost, Stolen, or Damaged” coverage: Beltone hearing aids are covered by a One-Year Manufacturer’s Limited Warranty, and free Lost, Stolen, or Damaged coverage. These coverages can also be extended if the user chooses to do so. Two-year protection for changes in hearing loss: If a follow-up hearing test determines that the user has experienced additional hearing loss that requires a more powerful hearing aid, this device will be provided to the user at no charge. Code of ethics: Beltone hearing professionals pride themselves in holding themselves to the highest standards of ethical and compassionate hearing care. Beltone hearing aids produce a broad range of hearing products, designed to suit the needs of those with mild, up to severe hearing loss. 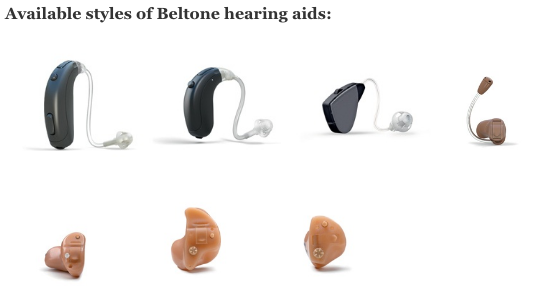 Whether the consumer wants a more advanced hearing aid with numerous features, or a more basic device that delivers the essentials, Beltone has a hearing product that can provide it. Many of their products are available in a full range of styles, allowing users to choose the perfect hearing aid for them. Beltone manufactures Invisible-In-Canal (IIC), Completely-In-The-Canal (CIC), Mic-In-Helix (MIH), In-The-Canal (ITC), In-The-Ear (ITE), Receiver-In-The-Ear (RIE), and Behind-The-Ear (BTE). These Beltone hearing aids are the choice for those who desire hearing help that can’t be seen. This Beltone hearing aid is worn completely within the ear canal and are most effective when treating mild-to-moderate hearing loss. The Beltone hearing aid MIC style takes advantage of the ear’s anatomy to provide near-to-natural sound quality, and outstanding appearance. The Beltone ITC-style hearing aids are custom-made, based on an impression taken of your ear canal and the surrounding area. They are slightly larger than completely-in-canal (CIC) hearing aids, but still considered cosmetically appealing. All of the components in an ITC hearing aid are encased within a lightweight plastic shell. These Beltone hearing aids partially-to-fully fill the outer ear. In-the-Ear (ITE) style hearing aids use larger batteries which can power a bigger receiver. 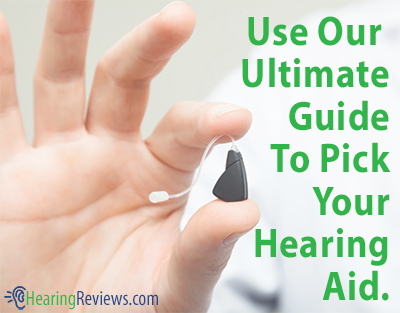 This makes them a superb choice for more serious hearing losses. These Beltone hearing aids are the newest BTE style of hearing aids and offer exceptionally natural sound quality. Beltone BTE devices are small and feature a curved casing designed to fit comfortably behind the ear. 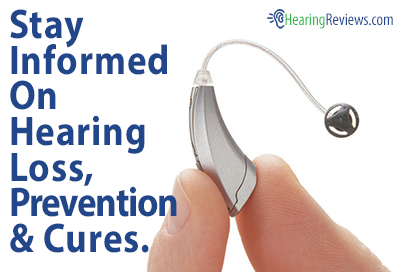 They assist the entire spectrum of hearing loss, from mild to severe. The hearing products that Beltone manufacturers include the True, LINQ, Origin, ACCESS, MARQ, EDGE 2, FORCE, and the TURN. Beltone LINQ hearing aids are an advanced series of Behind-The-Ear (BTE) and In-The-Ear hearing devices that are specially designed to deliver enhanced speech hearing and understanding. This promotes better, and easier communication between the hearing aid wearer and others. More information on this hearing aid and other Beltone Hearing Aids Reviews coming soon. More information on this hearing aid and other Beltone Hearing Aids Reviews models coming soon. Spacial Directionality: This feature allows users to focus on the person they are speaking to, while still hearing background noise at a volume that is non-disruptive and non-distracting. Speech Spotter Pro: This technology automatically eliminates background noise when someone is talking to the hearing aid wearer. This can help make in-noise conversations much easier. HPF80 NanoBlock: This protective nanocoating locks humidity, moisture, dirt, sand, and other debris from the Beltone hearing aids. This can help the hearing aids keep functioning like new longer, even for individuals who are extremely active. Feedback Eraser: This advanced technology eliminates the feedback that can occur on the phone, while making volume adjustments, or while putting on glasses. It can help provide users with more enjoyable, worry-free conversations on the phone. Sound Cleaner Pro: This is a noise-reduction system that automatically changes the hearing aid’s amplification and other settings according to the user’s current listening environment. Adaptive Directionality: This feature allows the user’s Beltone hearing aids to automatically target the person they are speaking with, even in the most difficult listening situations. Auto-Phone: This feature automatically detects when the user is on the telephone and switches to the hearing aid’s phone program for the best possible sound quality. Wind Noise Reducer: This technology can help users enjoy the outdoors more, as it significantly reduces the sound of the wind in the user’s hearing aid, which can become mentally exhausting after extended periods. Program Selectors: Many of Beltone’s hearing aids can be easily adjusted manually to suit the user’s different lifestyle and situational needs. Direct Audio Input (DAI) Compatibility: Some of Beltone’s hearing aids are compatible with DAI devices that allow for direct connection to sound sources like the radio, computer, or television. Telecoil: This allows sound to be transferred directly to the user’s hearing aids. The telecoil is especially useful in theaters, airports, and churches, where hearing is often difficult. Speech Pattern Detection: Beltone hearing aids with this feature automatically reduce background noise in noisy environments, providing the user with added comfort. Multi-Channel Maximum Power Output: The feature ensures that sounds are never too loud and uncomfortable for the hearing aid wearer. Loud, sudden, impulsive sounds are reduced to a comfortable volume. Open-Fitting Options: Many of Beltone’s hearing aids deliver an open fit, which means the ear canal is left open, so the user is not bothered by the sound of their voice due to a “plugged up” sensation in their ears. Silencer: This feature suppresses soft background noise, like the hum of a refrigerator or a fan, while in quiet sound environments. Satisfy: This feature allows the user to slowly adjust to his or her sound environment until they reach the optimum level of amplification. Low Battery Notifications: Beltone hearing aids provide users with vocal warnings of low batteries, or program changes. Automatic Volume Control: Some Beltone products provide users with automatic volume adjustments as they move between sound environments. This allows users to move seamlessly between listening situations without having to make any manual adjustments to his or her device. Directional Microphones: These specialized microphones help the hearing aid wearer focus on conversations. This is especially useful in loud sound environments. Smart Gain Pro: This feature allows the Beltone hearing aids to automatically increase or decrease their gain and noise reduction settings when the hearing aids recognize a change in the user’s listening environment. This lets users make fewer manual adjustments to their hearing aids as they move between varying sound environments. Tinnitus Breaker Pro: This advanced feature generates white noise sounds to counteract tinnitus, or ringing in the ears. This feature can be adjusted by a Beltone hearing specialist for different frequency and noise signal levels according to the characteristics of the user’s tinnitus. In addition to numerous advanced features, many of the Beltone hearing aids are compatible with the company’s accessories that can provide an enhanced hearing in different situations. These products in Beltone’s Direct Line series are easy to use and deliver wireless access to the audio of the user’s electronic devices. This device helps the user hear exactly what he or she wants to in noisy environments. It is small and portable and can be worn by somebody the hearing aid wearer wants to speak to. The device picks up their voice and streams it directly to the user’s hearing aids, where it can clearly be heard. The device can also be placed in front of electronic devices, or connected to a computer, MP3 player, or other electronic devices. This accessory allows users to stream high-quality audio from the user’s television, stereo, or computer directly to the user’s Beltone hearing aids in stereo sound (it is heard in both hearing devices). This device even works without a relay device or a neck loop that needs to be worn. This device allows for easy and clear phone conversations. The device clips to a shirt or jacket and is small enough that it will hardly be noticed. When the user hears the phone ring in their hearing aids, they press a button on the device to answer, and they start talking. This easy-to-use device allows users to hear their conversations in both ears, making it easy to hear in almost any listening situation. This handheld device lets users change the volume or program of their Beltone hearing aids reviews quickly and easily. It features simple controls, and a large display that even let users adjust volume settings on their television, stereo, or computer. The display allows users to see the hearing aid’s volume level, its battery status, and the current listening program being used. Beltone’s hearing aids reviews and other hearing products have helped make it one of the largest providers of better hearing in the world. Its numerous products, available in different styles, and multiple easy-to-use accessories help make hearing a possibility for people with a wide range of hearing loss. With all the company has to offer, users will likely find a Beltone hearing device that is perfect for them. 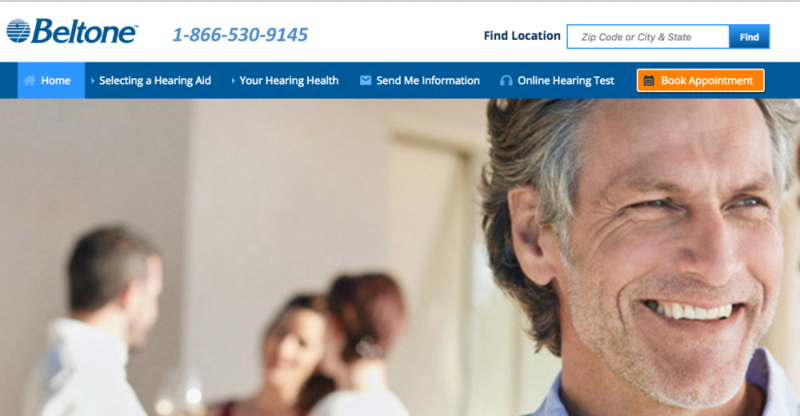 For more Beltone Hearing Aids Reviews and other brand reviews visit HearingReviews.com. Beltone’s hearing systems help you listen to in community such as cinemas. It can be hard to listen to in community even when you aren’t hearing inhibited. I purchased 2 The Edge2 hearing Aids (in `2007) in York, PA Beltone Hearing Center. I took special care of them; the original cost tome was ~$7000 for the pair with a battery charger. First, the charger did not work after the first 8 months. I was told they are NO longer made and cannot be repaired!…So, resorted to OTC batteries that would last about 7 days; and needed replaced. All went well till 2014 , I had a semi-annual checkup. I was told my hearing was worse and I needed new Hearing Aids. The exam noted my hearing was -60db at 80% hearing (not good they say). In July another appointment was scheduled for me by the Owner, Mr. William E. Kovack..He told me I was in denial; and needed new hearing aids.> I did not believe him; made an Appointment with an Ear, Nose, Throat Specialist…Examined and found my hearing to be -60db was 100%. HE told me you DO NOT NEED Hearing aids; your hearing is normal for your age.. and normal speech range. To get examed in 2 years if concerned; our having problems. interesting that 2 HA quit instantly!! Think the programing in the HA was planned. I DO NOT RECOMMEND BELTONE, ESPECIALLY THE AREA OF YORK, HARRISBURG, HANOVER Areas.THIS same OWNER is NOT Ethical in his Business, DO NOT RECOMMEND HIS CENTERS!! !>>>I contacted the Beltone Corp. Center and told they cannot do anything for me; I MUST deal with Mr. Kovach..WOW!! !What BS! OK, here’s the deal for me. I’m 45 years old. I purchased a set of Beltone Legend 17 aids in June 2016, so I’ve had them for less than one year. I bought them in the U.S., but I live abroad in a country where Beltone operates. My warranty is international but the local distributor will not facilitate the repair one of my devices requires. I had to ship it back to the U.S. at some expense in order to get the original seller to initiate the repair. To be fair, the store where I bought them was great. They were very professional and their assessment of my hearing coincided with that of my ENT. My problem is not with them, or really with the product. The product has been very good overall. My problem is with the support after sale and the fact that Beltone says their devices have an “international” warranty if one cannot get support overseas. I was never informed by the first office that I was entitled to a $1,000 coupon Plus $1,800 Insurance policy by my employer. PLUS I could keep my older Aids. I was sold a pair for $9000.00 financed at 12.99% and even the finance company was in on the con. I’ve been paying additional principal on the loan and Allegro credit has been putting it in a n account credit to maximize interest. The BELTONE hearing aids are over priced, the quality is questionable, the batteries were special sized that you need theirs. It gives you a warning that using standard batteries could damage your device. I’ve got 4 more years of buyers remorse before I get an actual pair of hearing aids and I can guarantee that they will NOT be BELTONE. My advice is shop around and STAY AWAY FROM BELTONE.